The official blog of the Aneka Jansen sci-fi stories. I am just going to post this link up and let you guys draw your own conclusions. Robots, and Cyborgs, and AIs. Oh my! So, what is an artificial intelligence (AI)? What makes a robot different from a cyborg? At least as far as the world Aneka Jansen finds herself in, this article is going to give a few definitions. A robot is basically any device which acts somewhat autonomously and is used to replace human effort in some way. 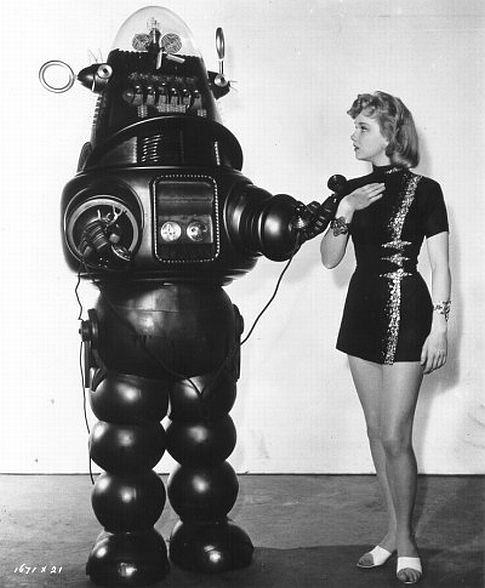 Robots of various forms have been described in literature since the first century AD. Da Vinci had a design for a “Mechanical Knight.” The word itself comes from a play by Karel Čapek, Rossum’s Universal Robots, penned in 1921. By the time of Federal Standard Calendar year 523, where Aneka finds herself, robots have a more specific definition; a robot is an autonomous device functioning under the control of an artificial intelligence. If a robot doesn’t have an AI running it, it’s known as a drone. Robots come in a fairly large number of shapes and sizes, and configurations. Aneka buys a “swarm dress” in the book, which is a garment composed of a large number of tiny robots which hover near the skin and can be programmed to form different shaped clothes, or to light up in various ways giving a dynamic patter. We meet Cassandra, a fully humanoid robot containing a sentient AI. On Harriamon Monkey gets a scare when a huge ore transporter robot comes barrelling down a tunnel toward them. The Jenlay are not really very keen on robots and those that exist tend to do things humans don’t want to, or that it would be far safer for a robot to do them, such as freight handling in space. Technically one could describe a robot as a cyborg. The term is short for “cybernetic organism,” and a robot is an organism which is cybernetic. However, the term is more commonly used for beings which are a melding of organic and machine. Most people use the term for humans who have had mechanical devices wired into them somehow (which gives me an excuse to use a “Michelle Ryan in a jumpsuit” picture) , and the term normally implies that the wired in devices are more integrated than current artificial limbs. The T101 Terminator from the film of the same name is, however, described as a cyborg since it has an organic, living skin over a robot endoskeleton. Aneka could be said to be the same since she has an artificial, but living, skin wrapped around her cybernetic body, and she takes it all a step further by having a “natural mind” running as software on a computer running that body. Much as robots are mistrusted in the Federation, so cyborgs are treated with a hint of fear by most jenlay. Ella, who lost her eyes as a child and had them replaced with cybernetic ones, has been subject to this prejudice ever since. Being cyberised is not unheard of on federal worlds, and is not even particularly uncommon on the Rim where medical practices are a little less sophisticated. However, people are not rushing out to have their eyes replaced with high-definition cameras, or their arms upgraded for added strength. Instead, the Jenlay have been subject to a lot of genetic manipulation over the centuries. Synthetic minds come in two distinct forms in the world of Steel Beneath the Skin, volitional and non-volitional. What’s the difference? Well, a volitional AI has volition. Obvious isn’t it? No? Damn. Okay, explanation by example seems like the best thing, and will also help explain why the Jenlay are fine with non-volitional AIs, but tend to freak out a little around the volitional ones. Would you want your fridge deciding that you really should eat less fatty foods, so it chucks out your bacon while you aren’t looking? Or your toaster developing a fixation and demanding that you eat toasted bread products all the time? No? Didn’t think so and that is why most devices you’ll find with any intelligence above “blink a light when there’s a fault” have a non-volitional AI embedded in them. Non-volitionals are able to understand people, how they speak, how they respond to the behaviour of the device they are using, and when they are being sarcastic about ramming that slice of toast where the sun don’t shine. An AI driving a car can do so as well as a human would, even though that is a drastically complex task. However, a non-volitional AI will never come up with plans of its own. Your toaster is not going on a crusade to further the consumption of toast. Your car will take you where you want to go, by itself, and not decide you should go visit your mother instead. A volitional AI is fully sentient. They make plans, have opinions, and come up with ideas of their own. They are, to all intents and purposes, artificial, living minds with the needs and wants of any living thing. Well, sort of. That’s where the problems start. A volitional AI may think the way a human does, within the wide range of thought processes humans are capable of, or they may have an entirely alien viewpoint. People grow up with variant views on life based on their genetics, upbringing, education, and environment, why shouldn’t an artificial mind? This is one of the reasons why research into volitional AIs is banned in the Federation. Generally, non-volitional AIs are created, programmed specifically for their task, and the limitations on their coding make it verging on the impossible that they would ever break their programming. Verging on the impossible, of course, does not mean the same as “can’t happen.” Cassandra, a sentient android, is an emergent AI. No one has yet determined why emergents exist, but the possibility that they will awaken spontaneously on complex enough computers is the reason that a license is required to operate machines considered liable to manifest emergent AIs.